In the Yogic tradition, food is alive, with a prana of its own. When consumed, the quality of the food influences the qualities of your body and mind. 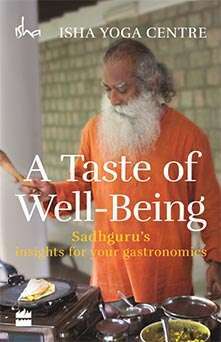 In ATaste of Well-Being, you will find a wealth of recipes that have been perfected in the kitchen of the Isha Yoga Centre, enjoyed by millions of visitors for over twenty years. Ranging from refreshing juices and salads, to complete meals of grains, cereals and curries, to tasty desserts for those with a sweet tooth, the positive-pranic adaptations of each dish are a treasure for all those who’ve always hoped healthy eating could also be tasty!